When Microsoft announced that they would no longer appear at the International Consumer Electronics Show (CES) after the 2012 event, some observers misread this as a sign of the show's imminent decline. For many years the show's ceremonial kickoff, the pre-opening Monday night keynote presentation, was delivered by then Microsoft CEO Bill Gates, who was later succeeded in both the CEO and CES roles by Steve Ballmer. Microsoft had also occupied a large space on the Central Hall exhibit floor at the Las Vegas Convention Center, directly opposite Intel, in a vivid testament to the longtime dominance of the Wintel empire. Who would fill the vacancies created by the Redmond giant's departure? As Mark Twain famously declared, rumors of CES's death were greatly exaggerated. The 2013 incarnation was bigger than ever, and Microsoft's exit - intentionally or not - provided a perfect opportunity to mark the ascendancy of the new set of companies that have ushered in the post-PC era of mobile computing. 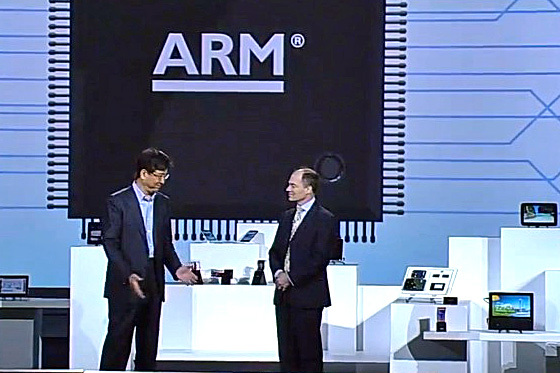 Qualcomm CEO Paul Jacobs took over as CES keynoter, and Steve Ballmer couldn't resist making a cameo appearance to promote his company's Windows 8 products smartphone and tablets products, which run on Qualcomm's Snapdragon processors. As Jacob's noted, Qualcomm is not even a Consumer Electronics company, so his appearance was especially significant for what it said about the shift in power within the semiconductor industry, and the importance of application processors. 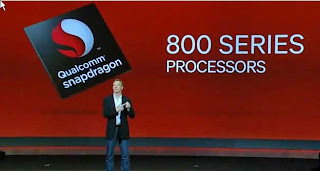 Jacobs used the spotlight to feature the next-generation of Snapdragon processors, especially the top of the line 600 and 800 series. The 600 Series, he said, offered the industry's best performance per watt, even better than competitor's newly announced devices. 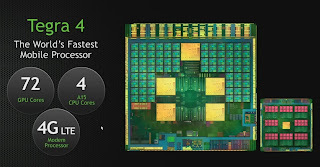 The night before, at his company's CES press conference, NVIDIA CEO Jen-Hsun Huang had made his claim to "The World's Fastest Mobile Processor" with the introduction of the Quad + 1 core Tegra-4. As in the Tegra-3, NVIDIA is employing their variable Symmetric Multiprocessing (vSMP) architecture, upgrading the ARM Cortex A9 with a set of four Cortex A15s, backed up by a fifth core - a Cortex A7 - for less-intensive, low power operation. At their press event, NVIDIA focused heavily on gaming applications for the Tegra-4, in which they have integrated a total of 72 GPUs. Huang also described a new computational photography engine, which is capable of taking two photographs at a time for brightly backlit, High-Dynamic Range (HDR) applications. NVIDIA is attempting to catch up to Qualcomm's ability to integrate 3G and 4G modems with their application processors, and Huang also announced a new i500 LTE modem developed through the company's 2011 acquisition of Icera. The i500 is a separate chip, which employs Software-Defined Radio (SDR) techniques. Other DSP baseband designers, such as CEVA and Altair, also have developed SDR, so this is not the industry first that Huang claimed at CES. 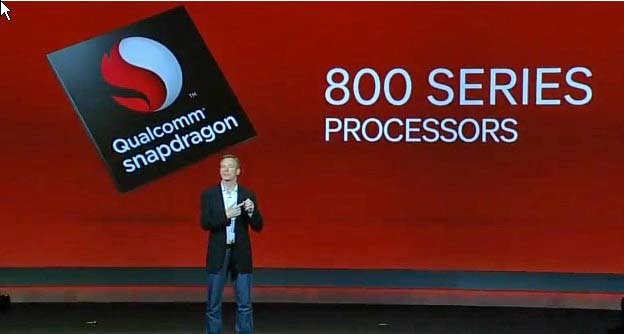 Jacobs said that Qualcomm's Snapdragon 800 Series is designed for the next generation of LTE-Advanced, and can support download rates up to 150Mbps. The 800 will also integrate the latest 802.11ac WiFi, and ups video capability to the UltraHD level for playback and recording, at 4X the resolution of 1080p. The CES spotlight continued to shine on the mobile semiconductor companies, with Dr. Stephen Woo, President of the Device Solutions Business at Samsung Electronics, taking the keynote stage on Wednesday morning. (Following the Tuesday night keynote by Lowell McAdam, Chairman and CEO of Verizon Communications). Dr. 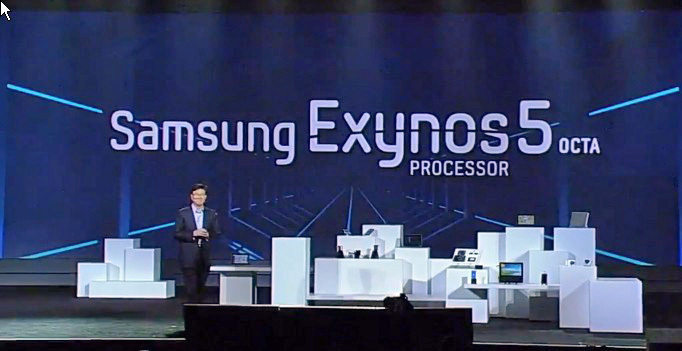 Woo escalated the quad core wars when he introduced the new Exynos "Octa". Samsung's differentiation is a Dual-Quad architecture that integrates four Cortex A15s, and a second Quad of A7s, in ARM's big.LITTLE architecture. The Octa will only operate a maximum of four CPU cores simultaneously, but tasks can shift dynamically between the two sets of processors in order to optimize power. 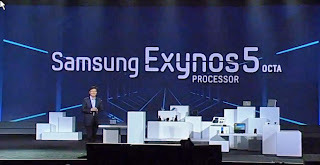 Woo claimed “Never before seen processing power” for the Exynos-5, just before bringing ARM CEO Warren East onstage to share the spotlight, in a fitting conclusion to the mobile processor parade. And who would fill Microsoft's space on the exhibit floor next to Intel? Hisense, a Chinese TV manufacturer, who featured the Android-based Google-TV in their expansive exhibit.